Essentially, I am really after the evidence as to whether the Atkins (and other low-carb diets) work (as a diet, and also are they good for our health?) – are you able to summarise the findings? I understand the thinking is just as controversial as ever. There also seems to be a disconnect between the number of people on low-carb diets, and the NHS advice – which is that starchy carbs should make up a third of the foods people eat. Why is that? There is an idea that while low-carb diets might indeed be effective for weight loss, they are bad for health, particularly the heart. This is because they have an image of being full of foods rich in saturated fat such as red meat, eggs and butter. Actually, people on low-carb diets tend not to eat more fat than they were before (they just eat less carbohydrate). But perhaps more importantly, saturated fat is not strongly linked with heart disease at all. In fact, countries like France, Austria, Switzerland, Germany, the Netherlands, Sweden, Denmark, Norway and Finland consume a lot of saturated fat but have relatively low risk of heart disease. This evidence simply does not support the idea that saturated fat causes heart disease, and neither do other studies in which eating less saturated fat has not been shown to benefit health, including heart health. Actually, there is plenty of evidence which shows that low-carbohydrate diets improves markers for heart disease across the board. For example, they tend to reduce levels of blood triglycerides (unhealthy blood fats), raise levels of ‘healthy’ HDL cholesterol and lower blood pressure. They also tend to shift the type of cholesterol in the bloodstream from the small, dense, damaging type, to the larger, less dense, more benign type. Despite all this evidence, there are some who remain sceptical and will continue to argue for the clearly inferior low-fat approach. It’s a plain fact of life that thinking can be slow to change even in the face of overwhelming scientific evidence. Also, certain commercial concerns such as margarine manufacturers and bread makers have an interest in maintaining fat phobia and fund some of the bodies such as the British Dietetic Association and British Nutrition Foundation that assume to tell us what to eat. However, the idea that the food industry has perverted nutritional messages is now widely known, and people are increasingly looking to the internet for their information. There you will find first hand accounts from countless individuals who have transformed their health for the better using low-carbohydrate eating, along with the science that supports this approach. Increasingly, this is what people are interested in, not the out-dated and unscientific views of their doctor, dietician, industry-linked nutrition organisation or Government. 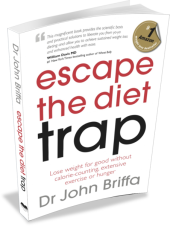 John Briffa, a doctor specialising in nutrition and author of Escape the Diet Trap, is one of those who sets himself against the likes of the British Dietetic Association and British Nutrition Foundation. The interest shows “first hand accounts from countless individuals who have transformed their health for the better using low-carbohydrate eating, along with the science that supports this approach”, he argues. It occurred to me that the journalist had asked me for the ‘evidence’, but none of that had that made it into the piece. So I wrote back to the journalist and ask her why that was and what her thought processes were regarding this. I pointed out that it made it look my case for low-carb eating was essentially based on anecdotal reports on the internet. In terms of expanding on the evidence, it was down to word count, and I felt I’d illustrated some of the evidence supporting and criticising low-carb diets in the headlines paragraphs, which link through to articles with more detail on the various studies. However happy to add a little more to the section I attribute to you if can do so succinctly and my editor is OK with it. I don’t know what ‘headlines paragraphs’ are, I don’t see any discussion of the actual science in the piece (where it should be, I would contend), and justifying the exclusion of the science on the grounds of ‘word count’ seem utterly specious to me (space on the internet is unlimited, unlike in print publications). He says there is an enormous amount of scientific research that supports low-carb diets, and in particular the fact that studies, overall, find them superior to low-fat, calorie-restricted diets for weight loss. On top of this, he says, the internet provides “first hand accounts from countless individuals who have transformed their health for the better using low-carbohydrate eating”. He argues that the evidence does not support the idea that low-carbohydrate diets are bad for the heart. “First of all, studies do not link saturated fat with heart disease, as is often claimed, and eating less saturated fat has not bee found to reduce heart disease risk either. Also, studies show that low-carbohydrate diets lead to an improvement in a range of heart disease markers including lower blood pressure, reduced levels of triglycerides and improvements in the types of cholesterol in the bloodstream. You can read the whole piece here. But, unless someone actually links through to the piece I offered up here, the BBC piece is still essentially devoid of critical science. So, in short, I was asked to summarise the research findings, but when I provided these the journalist appeared quite disinterested in conveying these to the public. I think this is poor journalism. And I think the public deserves better. How reliable are cardiovascular disease calculators? Thanks for trying John, better to light one candle than shout at the darkness and all that ! I love your initial response to her request which is great explanation of low carbing. Unsurprising regarding the journalist. There are not many who have the luxury of writing what they want and the comment about word count tells you all you need to know about people transported from print to new media. I can’t avoid asking you to edit this article, which incorrectly uses disinterested when it means uninterested. disinterested means impartial, so perhaps it’s correct, but I guess that’s not what you intended. I applaud your tenacity in the face of sloppy journalism. Though it’s not correct to use the word “disinterested” (which means unbiased) in your headline. The word should be “uninterested”. As someone who use a low carb diet I think your arguments are compelling, but as a journalist I think you’re being harsh on the BBC. It’s the journalist’s job to sum up your case concisely – not to reproduce your words verbatim. Also ‘disinterested’ doesn’t mean what you think it does…. Perhaps, ‘uninterested’ would be better. Simon – I didn’t expect the journalist to reproduce my words verbatim. I did expect her to go a much better job of referring to the science, though, and providing the reader with a more evidence-based appraisal of this way of eating. In short, I think her journalism was sloppy (perhaps even lazy). You are, of course, quite within your rights to believe her work was up to scratch. To be fair, she asked you for the evidence, and your response summarized it, without actually demonstrating that it’s strong and believable. No citations, no lists of studies or meta-analyses, no debunking of often-quoted bogus research. While she may not have been able to publish all that, it would have helped make up her mind. May I suggest that such a list would be extremely helpful, if you were to publish it and keep it updated? I take your point, but the way things tends to work is for statements to be made, and for the contributor to be prepared to provide the evidence if requested. If the journalist had doubts about the veracity of my statements she could have asked for me to validate them. But, again, I take your point. I also take your point about a list of relevant research, but what would that list actually contain? My blog and books contain the references which provide evidence for the assertions I make as well as support for low-carbohydrate eating in general. the media are endlessly looking for a headline and are rarely concerned with proof or rigour. I learnt this recently when I released a book called Be Your Own Nutritionist that extensively references Dr Briffa’s work. It details how incredibly healthy a truly traditional British diet is (i.e. pre late-Victorian). This diet is packed with low carb staples like shellfish, meat, dripping and broths. Journalists aren’t interested though – it’s too much common sense! I put off reading Dr Robert Atkins New Diet Revolution for some time despite I knew I must in the line of research. Atkins integrity had been subjected to assassination by the media machine and so far as I can recall the BBC were a part of that. When I did read the book I found it objective in parts while the substance was spread a bit thin amongst a lengthy word count. Part of Atkins problem was that he didn’t answer the potential critics in advance. Some of what he tabled deserved underpinnings at least one or two levels deeper than the prime idea. But as you have said previously ketosis and ketoacidosis are not the same thing yet sound similar enough to be confused with the other, and that was a big stumbling block. Atkins also went against the dogmatic belief that saturated fat and cholesterol are causally implicated in heart disease, and of course, people who invest the requisite level of time and effort to actually check know this isn’t the case at all. But I found the core idea convincing. If a creature gains weight in the wild it does so for reasons of adaptive benefit, ie an aid to survival. So when a creature, like a wildebeest gains weight it does so as insurance against leaner times ahead. There is no adaptive gain sequestering reserves of saturated and monounsaturated fats as body fat unless physiology and biology can draw down upon those sequestered reserves. Hence in other words the ability of a mammal to burn its own body-fats is normal and adaptive. Perhaps we can be a bit clearer today John that the hormone insulin largely controls the sequestration of fat, and if levels of insulin remain high then the conversion of blood glucose to body fat is encouraged while the reconversion of body-fat to fuel is discouraged. Atkins hints at the state of glucosis (supplying too much blood glucose form carbohydrates) as being an impediment to what would otherwise be natural weight loss for someone with adequate fatty reserves. But you can mention Atkins name and say his core thesis was broadly correct and their face will redden to a likeness of a baboons rear end despite they have never read Dr Atkins nor cast any thought over the validity, rather the complete lack of it, in the diet-heart hypothesis. It must be hugely frustrating to be a champion of the pitfalls of high-carb eating, be asked to submit a piece, trouble to explain matters in the way they deserve and have some pillock completely ruin any gravitas. But Joanna Blythman got one past the features editor of the Daily Mail. See ‘Ignore the finger-waggers. You SHOULD go to work on an egg!’ (Daily Mail online). I passed this article on to a board member of a meeting I attended on Wednesday along with a few short thoughts and a summary note. In it I suggested the adherents and proponents of the diet-heart hypothesis are the ones with egg on their faces. There was little time to converse, but this board member made a beeline for me at the close and thanked me for my sentiments. For what it counts I think we may be one small step closer to the appliance of science in high places. There is still a lot to be done. Retailers and processors must be hauled to account in addition to officialdom. You may be surprised to hear that things are changing in light of the recent changes in the NHS. Certainly, where I live, medical practices are now willing and able to recommend outside professionals to help their obese and diabetic patients with weight loss. This includes recommending low carbohydrate diets. V useful summary – it is perhaps not surprising that the low fat establishment clings on so doggedly. Drawbacks to conversion to idea that low carbs make more sense includes: large amounts of humble pie, tricky questions about exactly what it is that causing cholesterol to rise if not fat, yet more bad news for sugar companies. In other areas of science paradigm shifts infamously only occur with the death of the old guard so out with the butter knives! Thanks for an excellent effort John! You obviously didn’t write what she wanted to hear though. Her excuses (such as ‘word count’) are poor. I wish the journalist (and the media in general) was “disinterested” (ie impartial). I think you mean “uninterested”. Having read the BBC article it waffles on a lot. I’ve read around a fair bit on diet, but if I was coming to the subject cold I doubt that I’d be any of the wiser. The overall tone of the article seems to be anti-low carb, but that it’s a badly written piece is more significant. Sharper writing and Dr Briffa’s points could have been given a better platform. Very interesting, John, though not altogether surprising. Elsewhere on the BBC recently – in an edition of Inside Health, presented by Dr Mark Porter on R4 – the low carb diet has been dismissed yet again as being basically impossible because of, ho hum, the “laws of thermodynamics”. This is the same programme which continues to churn out obsolete theories about the best way to diagnose and treat hypothyroidism, and the same out-dated stats relating to its incidence in the general population. I used to consider this programme a reliable source of medical facts, but no more. Perhaps the info you gave was too involved for her to work out or she was hoping you would be anti those ideas, then she could just have said how you disagreed with it? What a missed opportunity! Surely the question she should have been asking is whether the current standard advice (that starchy foods such as potatoes, bread, cereals, rice and pasta should make up a third of the food we eat — as given, e.g., on http://www.nhs.uk/livewell/goodfood/pages/starchy-foods.aspx) is supported by the science. I see that the BDA is currently updating its fact sheet on carbohydrates, and I’ll be interested to read that. But she could have quoted the Harvard School of Public Health, which, while critical of low-carb diets, is also critical of US government guidelines (i.e. MyPlate, which the article links to) on the consumption of grains. The HSPH states clearly on its website that “grains are NOT essential for good health”, and adds, “What’s essential is to make any grains you eat whole grains, since these have a gentler effect on blood sugar and insulin than refined grains.” It also advises people to cut down on potatoes. Instead of exploring the science even superficially, she presents the whole issue as a conflict between Atkins (and Gwyneth Paltrow, and you) and “sensible” organisations like the NHS and the BDA. Utterly misleading. Oh, and sorry to be a pedant, but “disinterested” means impartial. It seems the journalist was uninterested in low-carb science. Or even just in science. Another great post and bravo for keeping up the fight against ludicrous dietary dogma. The response from the BBC was probably to be expected. I found the response from some of the comments here disappointing. While you fight on, three posts sought to correct your use of the word “disinterested” While the Titanic sinks, some complain about the lack of deck chairs, it was ever thus. And here’s an interesting question..
At what point can we sue the government for continuing to give us and our children bad advice on nutrition despite doctors such as yourselves continually trying to make them face up to the fact that their advice has been wrong? I was invited to have lunch with my son at school for Mother’s Day. The meal was depressing. Not an ounce of fat in sight for the main course (not even butter for my roll). Tasteless low fat custard for dessert. Our school children are all on a low fat diet! Isn’t “not” missing between “does” and “support”? I would have thought this was far more serious – after all, you have written the opposite of what you actually mean! – than a discussion on “disinterested” and “uninterested”. When you’re up against the big boys of food and pill manufacturing, I doubt anyone will win until and unless the Government updates its advice. Then and only then will low fat and high sugar foods be reinvented to feed the market that wants to buy them because the Government now says they can/should eat them. When will this happen? Not in my lifetime I fear. John, many thanks for raising this very important issue. I have received very little constructive advice from my practice. After years on increasing amounts of drugs for diabetes, hypertension and high cholesterol, I am now taking things into my own hands, and by that I mean low carbing. All my conditions have completely been reversed, and I have progressively come off all medications. I am on top of the world!! I am keeping my method to myself, because I need to keep registered with a GP. I want BBC journalists to be DISinterested. I don’t want them to be UNinterested. I wouldn’t be too concerned. I read the article and couldn’t understand what the point was she was trying to made. Too much waffle, very little in the way of fact and not even really a clear opinion. Very poor journalism. 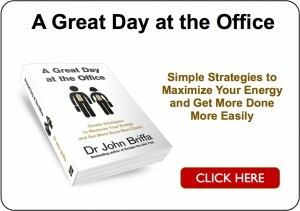 Thanks for this post Dr Briffa. Indeed, I find it amazing how the low carb approach is again and agian rejected by the medical community as an alternative approach for obesity, the metabolic syndrome and type 2 diabetes. I have found that people suffering from obesity or the metabolic syndrome are much more likely to lose weight and improve their metabolic function on a low-carb, high-fat diet. So what are we, medical professionals, afraid of? Reading the excellent DietDoctor.com blog today, I found several articles showing how dietitions and medical professionals, are being turned into shills for the Coca-Cola company. Was I surprised, not in the least ! Big pharma and junk food outfits have a grip on just about every organisation involved in health advice in the UK. One neat trick is call yourself a charity, of make your organisations name sound like a Government Institution. Big pharma and junk food spends $billions every year on their propaganda, far too many healthcare professionals have either swallowed the lies hook, line and sinker, or are on the payroll. Meanwhile, we have to rely on a relatively small (but growing) number of honest and informed HCP’s and bloggers. A David versus Goliath situation for sure. Check out these black OP’s outfits and their pay masters. However, the organisation’s 39 members, which contribute to its funding, include – beside the Government, the EU – Cadbury, Kellogg’s, Northern Foods, McDonald’s, PizzaExpress, the main supermarket chains except Tesco, and producer bodies such as the Potato Council. The chairman of its board of trustees, Paul Hebblethwaite, is also chairman of the Biscuit, Cake, Chocolate and Confectionery Trade Association. Current EUFIC members are: AB Sugar, Ajinomoto Sweeteners Europe, Bunge, Cargill, Cereal Partners, Coca-Cola, Danone, DSM Nutritional Products Europe Ltd., Ferrero, Kraft Foods, Mars, McDonald’s, Nestlé, PepsiCo, Pfizer Animal Health, Südzucker, and Unilever. I stumbled across a little thought the other day. I was thinking about ‘junk-food’ (or fast food’ if you like. ) Over-consumption of ‘fats-food’ is blamed for the current epidemic of obesity in society. Whenever you see an advertisement for ‘healthy eating’ the advertisers are at pains to emphasise the ‘dangers’ of fat. The other day, I tried to list, mentally, as many types of ‘fast-food’ as I could. Surprise, surprise. I would say that 95% of the foods I could drag up contained more starch than fat. E.g., how much fat, as opposed to starch, do you find in a normal Pizza; in a burger, in a packet of crisps? The list could go on. Why can’t the ‘experts’ see this simple correlation, and draw the obvious conclusion? It isn’t the meat that does the damage; it’s the bread. Thanks Hilda – corrected now. This article on the BBC website was the first time I had heard of you. I have since bought and read your latest book. Which was very interesting to read. It is a great shame that most of the literature on diet and health has no basis in science. It’s interesting that the ‘Atkins diet’ is always the one that gets written about – being the most extreme in its low-carb approach. I did try and follow it a couple of decades ago but it’s not easy to fit in with feeding a family and relies a lot on specially manufactured foods (such as low-carb snack bars etc) to enable people following it for longer without becoming ‘bored’ (and, of course, to create a new market for those ‘interested parties’ to be able to cash in on these things). Michel Montignac’s diet was more user-friendly but he still believed in the ideas that “all saturated fat is bad/cholesterol causes heart disease” which, nowadays, are in doubt in enlightened minds. 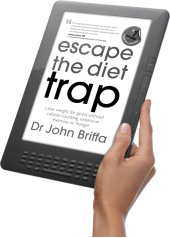 More recently I bought your book, Dr Briffa, and followed the guidelines in there – but as my partner does the cooking and doesn’t have a weight problem himself, it was a little less convenient for him to organise suitable dishes. Also, finding food when out and about (eg for a quick lunch) was tricky at times (think West Bay where all that’s available at the sea front kiosks is fish and chips, burgers etc). Finally a friend pointed me in the direction of Zoe Harcombe – and having been following her principles for about a month now, I’m finding my weight is going down without any real effort. I can still enjoy a glass of red wine now and then and a couple of squares of very dark chocolate each day and still lose weight. Basically her guidelines are to avoid all processed/refined foods, avoid anything with sugar or equivalent in, not to mix fats and carbs in the same meal, avoid any food that might aggravate food intolerances (causing cravings/indigestion etc). For me that means limiting wheat, but I’m able to eat oats, quinoa, the odd spud – but really my diet now doesn’t contain very much in the way of carbs from grains or potato – most comes from fruit and veg. Thinking back 40-odd years, my diet back then hardly contained pasta or rice and had much less bread and potatoes than is consumed in most people’s diets today. School dinners were proper dinners – meat, veg and that ghastly instant mash made with water or tinned new potatoes. We had puddings of course, and then at home another proper meal at night. Sweets and fizzy drinks were an occasional treat. I never had a weight problem, nor did most of my friends. Nowadays my children seem to be offered at school relatively high GI carbs in all shapes and forms – baguettes, rolls, pasta meals, baked potatoes……and no other option. It’s quite depressing to think that unless something is done now, these young people will never know that there are other ways of eating that can change their likelihood of becoming obese/diabetic etc. I work in PR/journalism and I don’t think that you have received negative treatment. Any contributor to a piece like this will feel short-changed by the finished article but of course the journalist can’t possibly include all your comments. The answer you provided was very, very long, probably as long as a typical BBC online article in full! If you don’t want to be misquoted or misunderstood then provide a couple of short, sharp paragraphs that cannot be misrepresented. You will never be the only expert included in an article. I don’t think this journalist had a particular agenda, she is simply representing, in her view, a balanced argument. And she probably didn’t know where to start when it came to editing your comment because you did not make clear what the important points were. Maybe a missed opportunity this time. 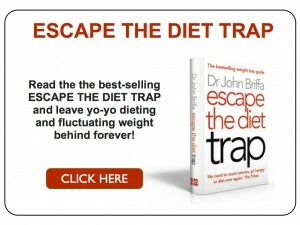 John, maybe you (and we in the low carb world collectively) need assistance from professional communications people or publicists. We tend to think that all we have to do is speak the truth, be able to produce the science to back up what we say and at some point ‘the truth will out’. But with all the big companies on the opposing side (great list, thanks for posting Eddie), it seems it is going to take a very long time to get to that ‘tipping point’ of opinion we are all waiting for. Maybe we should play them at their own game. After all, these big concerns wouldn’t dream of operating without their large marketing and communications departments advising on how best to get their points across and stifle the competition! Unfortunately the text you provided to the journalist was not “evidence”. You should have sent a list of published studies, with a short summary of the key points. She may not have had time to check your sources, but if you had listed only a handful of studies from reputable journals instead of providing unsubstantiated opinion you might have had a better outcome and enhanced your own credibility. It’ a shame, but all this has achieved (including this blog post) is re-emphasising an “us and them” debate, the like of which has been very detrimental in other scientific fields (e.g. Climate change). Dr. Briffa you were very brave taking that lot on. Their agenda’s are just too thickly set in governmental thinking and politically correct bases. You will be flatly ignored. A medical proponent of the diet in our neck of the woods said if everyone went onto lowcarbing or keto the maize and wheat farmers would go suffer. But nobody cared in the early 70′s when dairy farmers lost everything in favour of margarine. They scared people to death with all thing butter. And then- in came homogenised and watered down unnatural milk. Shocking. If we had as many honest and informed Doctors in this world, as we have critics, we would not have the epidemics of obesity and type two diabetes. A good point Jackie. All John needs is a couple of $billion a year and he could take them on, on a level playing field. Everyone says you should never talk to journalists and expect what you’ve said to be fairly reflected in print! As a journalist yourself I’m sure you’ve heard this. Also, I find the quality of science journalism at the BBC is very patchy. Sometimes they do brilliantly, sometimes they seem unable to think critically about science at all. Having said that I did feel it had got a bit better over the last half decade…. perhaps patchy is still the operative word. You could always offer to do some of their journalism on topics related to diet! I still find it interesting that even low carb advocates still dismiss the Atkins diet as being too stringent if you have read the book or done the diet you will know that it is only the first 2 weeks of the diet that are the strictest and this is to break the addiction to carbs ………so it is a bit of cold turkey (no pun intended) that you go through and then you start introducing more lower carb. non-starch vegies to the diet once you are on the maintenance phase of the diet you are basically eating normally just very sparingly of pasta, potatoes and bread so rather than having them every meal every day they are the occasional once a week treat so to speak. So if you really have read the book and done the diet you know it isn’t the scary thing that the low fat high carb people say it is and if you haven’t read it your comments prove that. As for the evidence asked by the reporter I think I would have given her every paper ever published that proved low carb was better …………maybe once she had seen how much evidence is actually out there she may have been more inclined to print prose similar to what you gave her Dr Briffa ……………I know i was stunned by how much research is out there and how much it is ignored by those with nothing to gain financially from publishing it in the mainstream media. As for the us and them debate on anything it is never helpful when only one side is listened to and everyone with a different point of view is ignored and then we are told the debate has happened ??? what debate? on diet or climate change has their been ….we are told there is a problem and this is the only way to view it and this is the only way to tackle it…not realizing that the very method of “helping” the problem just perpetuates it. It appears there may be a light at the end of the tunnel. This is an exerpt from an essay authored by Gary Taubes in this weeks BMJ. “In metabolic ward studies, in which the diets of the participants have been well controlled, researchers typically restricted the calories in both arms of the trials—feeding participants, say, 800 calories of a low fat versus a low carbohydrate diet—and so building into the study design one of the hypotheses that is ultimately being tested. What we want to know, again, is what causes us to gain weight, not whether weight loss can be induced under different conditions of both semistarvation and carbohydrate restriction. What can we do about this? It seems we have two choices. We can continue to examine and debate the past, or we can look forward and start anew. I just came across this article in the guardian, at least not all journalists are supporting the antiquated mainstream view on carbohydrates. Which only serve the purpose of fattening both the nation and the wallets of food industries. The BBC tends to be the worst offender for including the low fat or low saturated fat mantra in all articles related to health, but I have noticed a change of attitude recently in the printed press. Your writing is making a differenceThis change will be gradual as the nutritonists and dieticians know that a series of small turns is less noticeable than a U-turn. But it will come as more people experiment with even a slight substitution of fat and protein for carbohydrate and notice, as I did, the inches disappearing from their waists. Brilliant response! Not al all suprised. Great that you followed it up. I think the sand are shifting though , re people looking in the internet, I think ‘the public’ are getting savy to these BBc types, posing as journalists. The problem of obesity continues in the face of bad dietary advice: “NHS swamped by fourfold rise in obese children cases”, METRO 12th June 2013.